The annual Willesden Cycling Club picnic will be on Sunday 6th August, Langley Park, Bucks (off the A412) from 12:30 pm onwards. Those joining straight from the club run can be assured of a free shower. Please join us for fun, frolics and water fights. 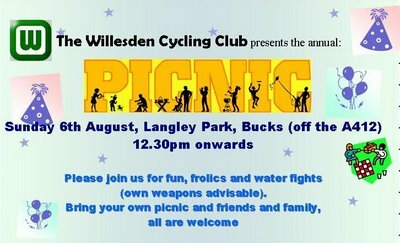 Bring a picnic, a family, weapons of mass drenching, a towel and a sense of humor.